Sonia: These two episodes fall into the post-sweeps lull this first season of Friends, so perhaps it’s not surprising that I found them both pretty lackluster. Both episodes are totally forgettable, and minimally important to the larger plot arc for the whole season. They’re filler, essentially. That annoys me a lot in television shows, but at the same time I have to acknowledge that given the way television production and ratings worked in 1994, it’s not surprising. At this point I’m beginning to see that a major hallmark of a terrible episode in this era of Friends is basically: How much Marcel does it have? If it’s not much, it’s has a chance. If it’s a lot, it’s probably terrible. These two episodes this week feel like they’re flooded with Marcel jokes, and they are tedious to sit through. In “The One With All The Poker,” Marcel wants to keep playing “The Lion Sleeps Tonight” on Ross’ CD player. In “The One Where The Monkey Gets Away,” Marcel escapes while Rachel’s babysitting him. It’s really, really hard to get worked up about an episode where one of the main agents of action is a character who cannot, you know, talk. Or emote. Joe: Sonia, this is the second straight week we disagree. Are we in a fight? Like Ross and Rachel after Marcel ran away? I not only mostly liked both of these episodes, but I thought that rather than filler, they were a sign of the major plot thrust of the season kicking into gear for the home stretch of the season. Even without the gift of hindsight, it would be easy to see that Ross-and-Rachel is the plot that’s going to have to come to a head by the finale. After a few episodes of eliding or straight-up ignoring the issue, these episodes tackle it head-on. I was pretty heartened to see that, with only a handful of episodes to go, things are coming into focus. I thought “Poker” handled the Ross-and-Rachel issue a bit better than “Marcel,” for a few reasons (one of which is that the former has far less of that infernal monkey). I liked that Ross got to step out of his sad-sackery for a bit as the poker scenes allowed a ruthless competitive streak to shine through (he is a Geller, after all). Watching the dynamic between Ross and Rachel shift while they got competitive with each other did more to sell me on them as a potential couple than anything I’d seen this season, particularly once Ross made that grand (secret) gesture at the end of the game. As a steadfast Game Night veteran, I generally abhor letting someone else win, but I’m not so hard-hearted as to think that was anything but a selfless gesture of love. Watching “Poker,” I can really see why seemingly the whole country got invested in Ross and Rachel. Sonia: Wha?! You cannot be serious! I grant you that the setup for the Ross/Rachel romance is interesting.The show is working towards the idea that Ross is everything Rachel wants, but she isn’t ready to see him as a romantic partner. It works, a little bit. I like that at the end of “Monkey” Barry barges in, signaling that Rachel isn’t quite over him (as evidenced by how upset she is about his engagement to Mindy). But honestly, something about Ross’ attitude towards Rachel in these two episodes just rubs me the wrong way. That part with throwing the game, that you liked—I cannot stand it. I think it’s supposed to be romantic, but it reads patronizing. Generally, Ross is trying to play to sympathy as a guy trying to get out of the “friendzone,” which at least now, a decade later, isn’t sympathetic at all. David Schwimmer does what he can with it, but I’ve noticed that the more Ross is “in love with” Rachel, the more frustrating and annoying his character becomes. It’s a crucial tactical error—one that explains why Ross and Rachel could never really be together for Friends to work. In the same vein, Rachel is at her most interesting and engaging when she’s single. 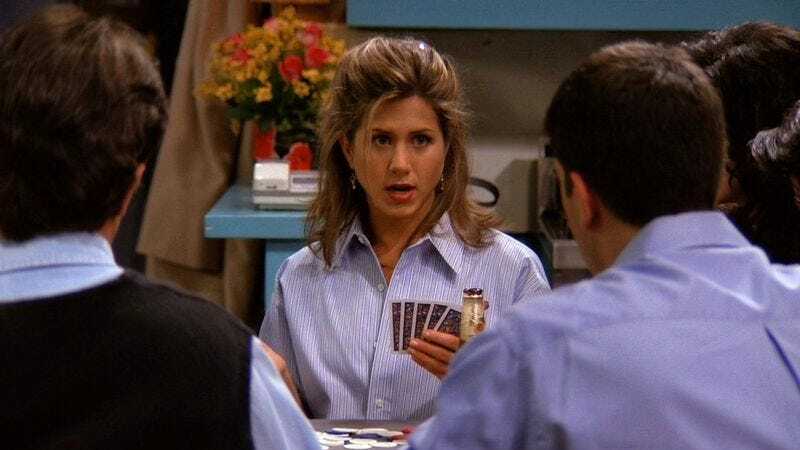 In these two episodes—but especially “Poker”—she is Rachel Green, queen of snark. She dishes out some extraordinary sharp critique of the boys playing poker before winning a hand of her own, and her bravura in the final scene is only slightly diminished by Ross possibly throwing the game so that she can have a win on her bad day. Without a relationship, she’s lively and relatable—applying for jobs, (badly) waiting tables, hoping for something new to come next. In a relationship (as with Paulo) she kind of disappears into the role of girlfriend. 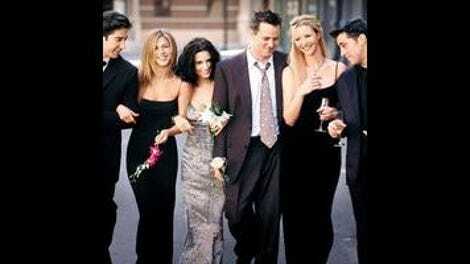 Somehow Ross and Rachel do better on their own then on-screen. Compare this to Chandler and Monica, who are four seasons away from becoming an item, but are also often much funnier when they’re both on-screen. In these two episodes they’re almost always seated next to each other. Maybe the producers had already planned a romance for them—but honestly, it seems more likely that Chandler and Monica play off of each other well as characters, and it was a late-game choice to make them romantically involved. Ross and Rachel are a kind of romantic-comedy duo, with good chemistry and building tension that leads to a kissing finale. It’s fun, but lacks staying power. Monica and Chandler, I argue, fit better into the pantheon of all-time greatest sitcom relationships. So yeah. We’re in a fight. Joe: I liked watching the dynamic between Ross and Rachel change in these episodes. We’ve seen Ross moon over her. These episodes, “Marcel Gets Away” in particular, show how unrequited love can easily bubble over into frustrated resentment. It doesn’t last long enough to make Ross an irredeemable bad guy — this show isn’t quite that daring — but I thought it was a nice touch of realism in showing that, ultimately, pining for Rachel from afar is ultimately not good for either of them, and we see that Ross finally realizes that he needs to declare himself. Of course, the show still has to hold out for the finale, so enter Barry in an act of obstacle-throwing so shameless that even the show seems to acknowledge it (“We have got to start locking that door!”). That said, I’m with you on Marcel and was certainly hoping that Animal Control Employee Marla Hooch would prevail and take that monkey back to where he belongs. But I’d much rather watch Marcel serve as a catalyst for Ross and Rachel’s interaction than as comic relief and wheel-spinning for Ross. I really liked that whole Marla Hooch subplot, I should say. Not only was it a valuable second life for a beloved star of A League of Their Own, but in an episode where Rachel’s flightiness led to bad consequences, we got another example of bad (or at least careless) behavior coming back to bite her. And of course, the more we hear about Queen Bee Rachel and Fat Monica, the more we get set up for the eventual flashback episodes.